During the last week of school Jaffrey Grade School hosted one its most beloved traditions, the JGS Talent Show. The auditorium was packed with parents and members of the community to watch and enjoy the Dr. Seuss themed nineteen act show. The Talent Show has been in existence for over twenty-four years. With the support of Student Council advisors Mrs. Springfield and Mr. Pelletier student council has run the talent show for the past twelve years. Sixteen student council representatives from third through fifth grade served as talent show audition judges. Judges sent the top scoring acts on to perform for the community. This year 5th grade representatives, Mia Boyd, Maya Pressman, Lilly Tullio and Alex Cummings, emceed the event and infused additional Dr. Suess spirit dressed as Thing 1, Thing 2, Thing 2 1/2 and The Cat in the Hat. The evening opened with Gumboot stepping by Hannah Manley, Lucy Dupuis, Bailey Middleton, Ben Sawyer and Alex Humphrey. 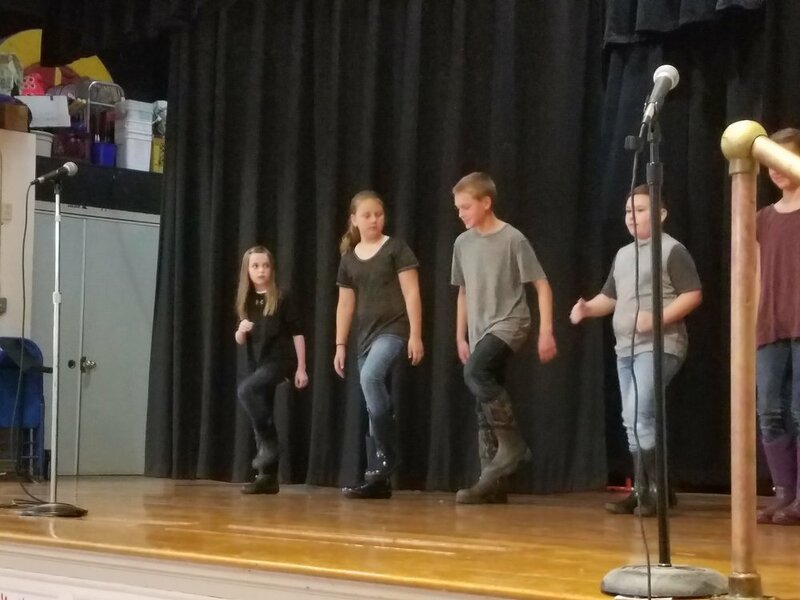 Students incorporated bells (symbolic of chains) with their stepping to pay homage to the South African mine slaves that developed Gumboot stepping as a form of silent communication. Other highlights from the talent show included grade level performances and the clarinets. Congratulations students and staff on another entertaining evening brimming with student talent! Photos courtesy of Susan Shaw-Sarles, Nancy Springfield and Bridget Wold. Thank you!